Through both legislative and communication efforts, BioForward promotes the activities of Wisconsin’s biohealth companies. To get legislative advocacy updates to your email inbox, click here to sign up for our newsletter. Mr. Brennan ran Tom Barrett’s 2002 gubernatorial campaign and has been CEO of Milwaukee’s Discovery World for the past 11 years. Mr. Cole currently serves as a commissioner for the Department of Neighborhood Services under Milwaukee Mayor Tom Barrett and is a member of the state Natural Resources Board that advises DNR. According to a profile on the city’s website, he was the first African-American forester hired by the Conservation Department. Mr. Carr was sworn in as a U.S. Marshal in 2010 after 30 years with the Milwaukee County Sheriff’s Office and is a member of the National Organization of Black Law Enforcement Executives. Earlier this year, Ms. Meaney was hired to be chief marketing officer for Milwaukee Film. She has served on the organization’s board of directors since 2012. The Senate and Assembly Republican/Democratic caucus concluded their leadership elections, thereby completing the leadership elections for all partisan caucuses for the 2019 session. GOP will hold a 12-4 majority on the committee next session. Each majority party in the Senate and Assembly get to appoint six members, while the minority party appoints two. Remaining appointments are still pending. Wisconsin voters turned out in record numbers for the midterm elections held November 6. The results saw a shift to blue at the top of the ticket, but red majority holding in the local legislative races. Governor’s Race. Heading into the election, the Wisconsin Governor’s race was a dead heat and the results reflected that. Democratic challenger, Tony Evers, beat incumbent Republican Governor Scott Walker with a 1.2% margin. Similarly, the Democratic challenger for Wisconsin Attorney General, Josh Kaul, narrowly beat Republican incumbent Attorney General, Brad Schimel. Congress. U.S. Senator Tammy Baldwin (D) easily defeated her Republican challenger, State Senator Leah Vukmir, and will go back to the U.S. Senate in 2019. Baldwin’s victory came with a 10-point margin and she will serve her second term. This was the first U.S. Senate race in Wisconsin history where both major party candidates were women. Interestingly, there were no party changes to the Wisconsin congressional line-up. Even though the U.S. House of Representative switched to Democratic control, Wisconsin’s congressional delegation remains unchanged in terms of party affiliation. The Senate Republicans gained one seat, further solidifying their majority for the 2019 session at 19-14. The Senate caucuses have re-elected their leaders unanimously. Senators Scott Fitzgerald (R) and Jen Shilling (D) will lead their respective parties in the State Senate for the next two years. Fitzgerald has been majority leader since 2011 and Shilling has been minority leader since 2015. BioForward congratulates all of the winners and looks forward to representing our membership before our new 2019 legislature and our newly elected Governor Evers. Our biohealth economy is growing in Wisconsin, yet we face issues related to workforce attraction and retention. We are continually looking for ways to further support our growing and emerging companies in Wisconsin through economic development initiatives and will engage with our elected officials in 2019 to further support our industry in Wisconsin. The results of the Wisconsin primary elections that were held on August 15, 2018 are IN and now Wisconsin is looking to the general election in November. It is expected that concerns related to education funding, access to healthcare and state transportation infrastructure will be a focus as candidates run for their seats in November. Governor: Governor Scott Walker (R-incumbent) will face former State Superintendent of Schools, Tony Evers (D-challenger) in the general election in November. Lt. Governor: Current Lt. Gov. Rebecca Kleefisch (R-incumbent) will be challenged by former State Representative Mandela Barnes (D-challenger). U.S. Senate: Despite reports of being out-spent in media buys, former State Senator Leah Vukmir (R-challenger) easily defeated Kevin Nicholson (R) in the Republican primary. Vukmir will face incumbent U.S. Senator Tammy Baldwin (D-incumbent) in the general election in November. CD-1 – OPEN: In the 1st Congressional District, currently held by U.S. Rep. Paul Ryan, candidate Randy Bryce (D) will face Bryan Steil (R) in November. There are also two independent candidates on the ballot for that race. AD-9 (Milwaukee): Current State Rep. Josh Zepnick (D-incumbent) lost to primary challenger Marisabel Cabrera (D-challenger). There is no opposition for Cabrera in November. AD-12 (Milwaukee): Current State Rep. Fred Kessler (D-incumbent) lost a primary challenge for his Assembly seat to LaKeshia Myers (D-challenger). There is no opposition for Myers in November. AD-18 (Milwaukee): Current State Rep. Evan Goyke (D-incumbent) easily held onto his seat in a primary challenge. He has no opponent in November. AD-86 (north central Wisconsin): Current State Rep. John Spiros (R-incumbent) from Marshfield, beat back a primary challenge and becomes the favorite for this seat in November. Spiros was the only incumbent Republican lawmaker to draw a challenger in the primary election. AD-59 – OPEN (eastern Wisconsin): There was a four-way Republican primary in the race to replace the seat left open by Rep. Jesse Kremer (R-Kewaskum). Republican candidate Tim Ramthun (R) pulled off perhaps the biggest upset of the primaries, winning the GOP nomination after he didn’t file any campaign finance reports in the race (i.e., he didn’t raise or spend enough to trigger the reporting requirements.) Outgoing state Rep. Jesse Kramer had endorsed his former aide Ty Bodden in the primary, while the American Federation for Children’s independent expenditure arm had backed Rachel Mixon, a teacher, in this primary race. We are pleased to report that on Tuesday, the U.S. House of Representatives passed a bill, H.R. 184 – The Protect Medical Innovation Act of 2017 that permanently repeals the Medical Device Tax. We thank the members of the Wisconsin delegation that voted in favor of this bill. This important legislation now goes to the Senate for full repeal under Senate Bill S. 108. Over the past eight years, the medical device tax, an excise tax on revenue not on profits, has continued to threaten medical innovation, patient care and job creation in the United States. An excise tax has a significant impact on emerging growth companies that require cash to be reinvested into their companies rather than being penalized through taxation on their revenue. Wisconsin has a specialized employment concentration in the medical device and equipment sectors that drive the economy throughout our state including our statewide supply chain to our medical device innovators and manufacturers such as GE Healthcare, Accuray, Spaulding Medical, Mortara, and many others. Full repeal of the medical device tax is not a partisan issue, it is an issue that impacts American patients, families, and innovators. We look forward to working with our two Senators to permanently repeal this destructive tax. Pursued Policies that Support Economic Development in the Biohealth Sector. Support for innovation through economic development initiatives is an important issue for BioForward. Accordingly, BioForward collaborated with The Water Council to design legislation with Senator Alberta Darling and Representative Adam Neylon to foster investment into specific industry cluster economic development programs such as challenge grants, R&D funding and increased investment into Wisconsin’s successful SBIR matching grant program-SBIR Advance. This legislation, (SB525/AB640) The Wisconsin Workforce and Innovation Network for Success (WINS) Act, successfully passed through standing committees with bi-partisan support, but failed to get approval by the full legislature this session. Throughout 2018 and 2019 we will continue to promote this legislation for passage in 2019-2020 budget session. Strengthen Healthcare Initiatives for Wisconsin Citizens. 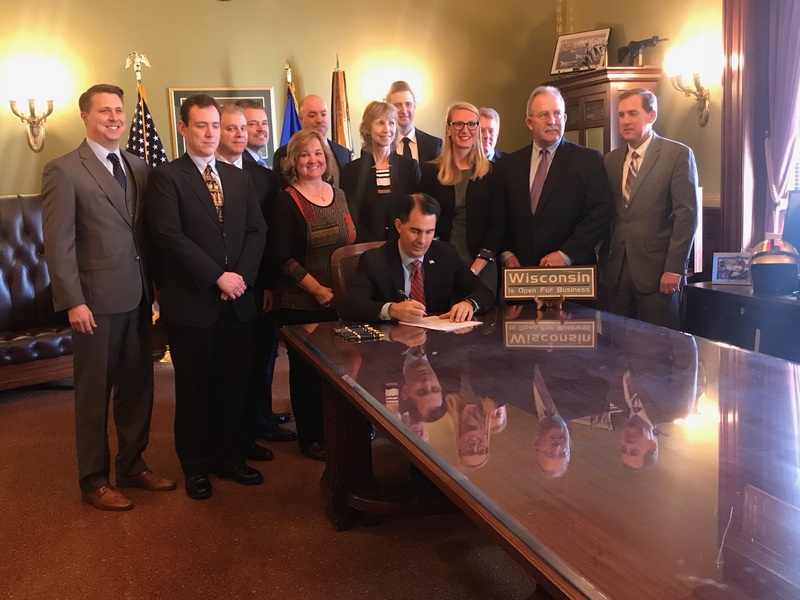 BioForward worked with BIO and a nationwide coalition of stakeholders to seek adoption of biosimilars authorizing legislation (AB679/SB575) in Wisconsin. This legislation was authored by a very strong group of bi-partisan legislators including: Reps Deb Kolste(D), Mike Rohrkaste(R), John Spiros (R) and Sens. Tim Carpenter(D) and Leah Vukmir(R). This legislation has passed both the Assembly and Senate is now awaiting Governor Walker’s signature. in Wisconsin that would ban specific types of research in the State. To date, no legislation has advanced in Wisconsin. Support Legislation to Promote Research, Jobs and Entrepreneurs. This session, BioForward also supported the UW in seeking an amendment to Wisconsin’s restrictive self-dealing law that includes an overly cumbersome and lengthy process for allowing research companies to contract with the university when a faculty or staff member has an interest in the company. Even relatively small contracts (any contract exceeding $250,000 over a two-year period) tied to relationships that have been reviewed previously by the university must receive a 45-day review by the UW Board of Regents. AB 758 / SB 671 authored by Rep. Dave Murphy and Senator Dan Feyen, along with Senators Risser and Rep. Berceau, will create a more workable system within the UW for development of management plans that will identify and manage any potential conflicts of interest. This legislation has passed the Assembly and awaits consideration by the State Senate in March. Federal Budget Bill Passage to Suspend Medical Device Tax. Although the medical device tax, an excise tax on medical device sales, was not repealed, BioForward and partners across the nation were satisfied with the continuation of suspending this burdensome tax. Wisconsin is a leading medical device manufacturing state and if this tax had not been suspended, companies from early stage to our large medical device companies, like GE Healthcare, would have begun paying excise taxes in January 2018, reducing their ability to reinvest in further product development and expansions. Tax Reform Act. BioForward took no position on this federal legislation. Similarly, BIO and AdvaMed remained neutral on this federal budget bill. BIO Fly-In. BioForward participated with BIO and other state associations for a legislative day April 2017, Washington D.C. We met with Wisconsin congressional offices focusing on biohealth issues such as NIH and FDA funding support, protecting Medicare Part B & D, medical device tax, and open discussions on drug pricing. BioForward supports the repeal of the medical device tax or at minimum, supporting the introduction of a 5-year suspension of the medical device tax. We continue to work with our partners, Advamed and MDMA, to advance this federal legislation. Senate Bill 422 / AB 83 (Darling/Duchow) – This legislation ALLOWS fetal tissue research to continue in Wisconsin, but establishes in statute the most stringent ethical standards for this type of research enacted by any state. (The ethical standards are taken from federal NIH guidance and IRB practices.) Bioforward is neutral on this legislation. Senate Judiciary Committee hearing was held on this bill on November 2, 2017. Senate Bill 423 / AB 549 (Mouton/Kleefisch) – This legislation would BAN the used of fetal tissue and cells from being able to be used in research in the State of Wisconsin. BioForward opposes this legislation. (See attached written statement.) Senate Judiciary Committee hearing was held on this bill on November 2, 2017. BioForward worked with Representative David Steffen and Representative Romaine Quinn to schedule an informational hearing before the Assembly Science and Technology Committee to brief the committee and the public about the emerging biomanufacturing sector in Wisconsin. The hearing was well-attended and consisted of the following invited speakers: Dr. Bill Murphy, UW-Madison; Lisa Johnson, CEO, BioForward; Dr. David Gamm, Co-Founder and Chief Scientific Officer, Opsis; Joanne Payne, VP of Human Resources, Phillips-Medisize; Todd Asmuth, SHINE Medical Technologies; Erika Long, Senior Director Government Affairs, Mallinckrodt-Stratatech. This was the first opportunity that BioForward had this session to talk to legislators directly about our industry, what changes are happening and what resources we need to continue to grow. It was critical to set the stage for the WINS Act legislation, which was release just a couple of weeks following this hearing. Signed onto a letter to Secretary Price to protect Medicare Part B for reimbursing providers for drugs and biologics administered by physicians. After a recent announcement of Foxconn Technology Group investing in a high-tech manufacturing plant in Southeast Wisconsin, a public hearing was held on August 3rd at the Wisconsin State Capital. Lisa Johnson, CEO of BioForward, spoke on behalf of Foxconn promoting the opportunities it can provide to the biohealth industry in Wisconsin. Interested in More Legislative Insight? BioForward is a member of the Cures for Tomorrow Coalition – a coalition of Wisconsin academic research institutions, bioscience-related trade groups and health care providers. The coalition supports and advocates for biomedical research in Wisconsin and is committed to educating the public about the value of biomedical research to patients and the state. Members of the Coalition include BioForward, the Medical College of Wisconsin, UW Health, the University of Wisconsin-Madison and the Wisconsin Alumni Research Foundation. Cures for Tomorrow engages with the Wisconsin legislature on any legislation that could impact or restrict the research that is permitted to be conducted in the State of Wisconsin. Legislation that would ban the use of fetal cells in research in Wisconsin has been drafted and has circulated for co-sponsorship, but as of the time of this writing, it had not yet been introduced. Research using fetal cells and tissue is already heavily regulated by federal law and the policies of our member research institutions. Profiting from the sale of fetal tissue, for example, has been a federal crime for more than two decades. Cures for Tomorrow members strongly oppose profiting from the sale of fetal tissue but do not believe that any additional regulation by the State of Wisconsin is needed. BioFoward and Cures for Tomorrow works to educate the members of the Wisconsin State Legislature and others about the life-saving research that is being done in the State of Wisconsin. For more information about Cures for Tomorrow, go to www.curesfortomorrow.org. Governor Scott Walker’s proposed biennial budget has been introduced and is in the process of being review by the State Legislature. The Joint Committee on Finance has completed its state agency briefings on the Governor’s 2017-19 biennial budget bill and held public hearings across the state on the Governor’s proposed state budget. The Committee will start voting on the budget provisions the first week in May and will continue through the early part of June. The goal is complete the budget process before the end of the fiscal year, which is June 30, 2017. Supported Representative Ron Kind’s sponsorship of the Protect Medical Innovation Act of 2017 that would repeal the Medical Device Excise Tax. Op-ed written by Advamed and BioForward on the repeal of the Medical Device Excise Tax. Oppose changes to the Medicare Part B Drug Program. Oppose changes to Medicare Part D Drug Program. BioForward participated with BIO and other state associations for a legislative day April 2017, Washington D.C. We met with Wisconsin congressional offices focusing on biohealth issues such as NIH and FDA funding support, protecting Medicare Part D, medical device tax, targeting abuses of U.S. patent system, and support to the Fostering Innovation Act. The Senate passed the 21st Century Cures act on Wednesday, sending it to the desk of President Barack Obama, who says he will sign it. The $6.3 billion legislation easily passed the Senate in a vote of 94-5 and the House in a vote of 392-26. BioForward is very proud to have been an engaged advocate for the Act, working closely with BIO, AdvaMed, and PhRMA to ensure biohealth advances continue. The November 8, 2016 election saw Republicans increase their majorities in both houses of the Wisconsin State Legislature. Republicans in the Wisconsin State Assembly and Senate have selected their leadership for the new legislative session that begins January 3rd. Also at the federal level Wisconsin became a “red” state at the top of the ticket for the first time since 1984 with a win for Donald Trump. BioForward and our member companies support and value the ongoing development of lifesaving research at UW-Madison, the Medical College of Wisconsin, and other institutions across our state. Our companies are the link between academic research and the therapies that are available to patients and families struggling with health issues or injuries. Accordingly, we are working with our colleagues from these research institutions and the Wisconsin Legislature to protect research in Wisconsin that utilizes fetal tissue.Under currently proposed legislation, in the State of Wisconsin, it would be a felony to use ANY fetal cells, fetal cell lines, or fetal tissues for research under all circumstances if those cells were obtained after January 1, 2015.The sale of fetal tissue is already illegal under federal law. We strongly support that prohibition and our research institutions abide by that prohibition. The bills currently being considered, AB 305/SB 260, go much further. If this legislation passes, we are closing the door on any future research that would be used to develop vaccines, therapies, and other medical innovations.For more information about this legislation and the Cures for Tomorrow coalition fighting to preserve research in Wisconsin, go to www.curesfortomorrow.org.